Three Alternative Ways to Wear a Scarf In the fashionista world, we tend to turn up the notch on our wardrobes for the chilly months, accessories become the key items to your over all look. Not only do scarves and gloves keep you warm, they also add a nice finishing touch to your outfit. When picking out the perfect scarf to wear, try to mix things up by breaking away from the standard knitted or wool scarf. Summer scarves can function just as well in the winter, and the bright patterns are sure to make your outfits pop. As the Examiner says, the thinner fabric is also great for tying around bags and purses to make them more chic and tie them together with your outfit better. Scarves also made it to the Marks and Spencer Warm & Cosy Hotlist, so they’re a sure hit in the fashion scene this season. Don’t just play it safe and drape your scarf around your neck though — take things to the next level by experimenting with different knots and styles! Here are some looks that you can try out: Option 1–Irish knitwear designer Sinead Clarke shows one creative way to wear a scarf. If you have a long scarf, you can wear it around your waist as a belt. This sort of tie goes very well with coats and dresses that need a bit more around the waist. 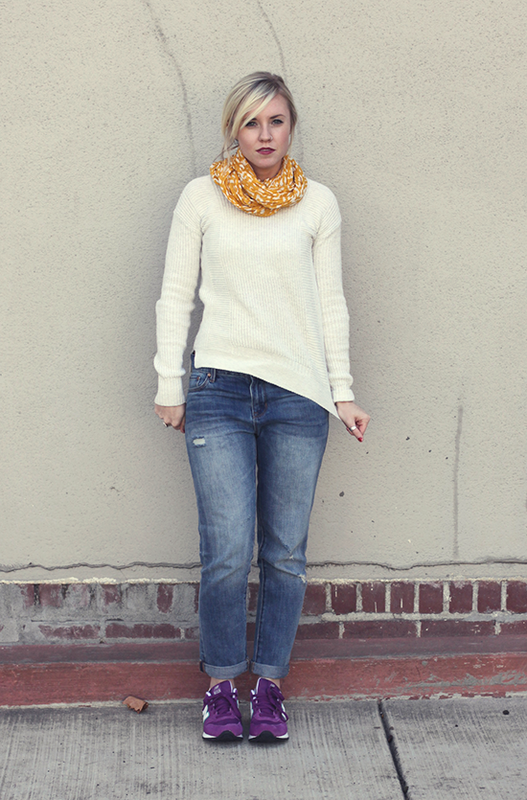 Option 2–You can stay even warmer by wearing your scarf over your shoulders like a shawl. This adds a whole layer to your outfit — and we all know how important layering up is for the winter. This look complements an outfit exceptionally well when you wear a scarf that has a distinct pattern or color. I tried a light scarf with a thicker sweater. 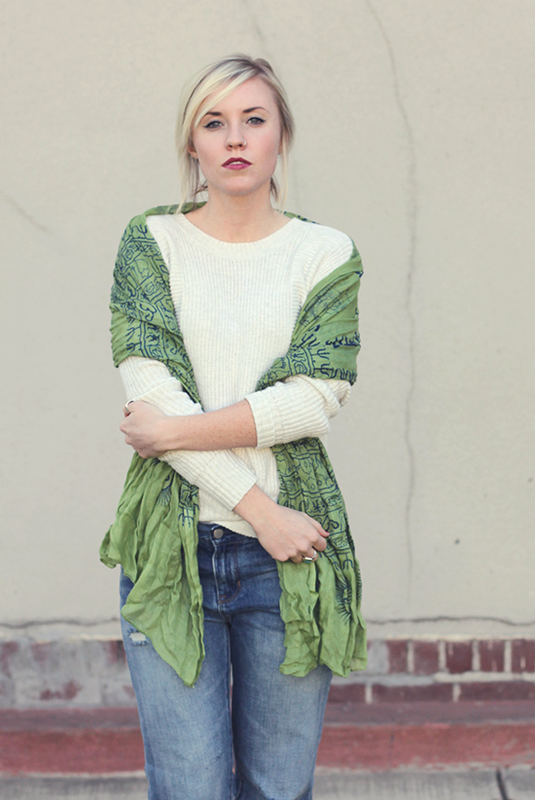 It’s an easy combo to try out with one of your summer scarves, add a with a warm winter piece like this sweater. Option 3–Etsy user MaineCoonCrafts illustrates the neck wrap, which neatly tucks in the ends of the scarf. Although it looks simple, some people have trouble figuring out how loose the scarf needs to be, or how thick the wrap should be. This great tutorial from Scarves.net can help you achieve an interesting symmetrical neck wrap in thirty seconds. Here is my version of the summer scarf : Thanks for tuning into for a few scarf tricks with me! What have you guys been up to these last few days? I’ve been watching Prison Break non-stop (I’m only on season 1–so don’t spoil anything!) Anyone watch that show? P.S. T-minus 1 day until Christmas! Toodles! The scarfs really add statement into the whole outfit!! I love both of these outfits. You have really good taste when it comes to colors and mixing.